I was watching my husband make dinner tonight, like he does almost every night, and I thought to myself, isn't it lucky that we live in a time and place where people don't hold so strongly to traditional gender roles? Merely thinking the words “gender roles” instantly brought my mind to grammatical gender (which I am finding to be a very troublesome aspect of German! At least it is easy to guess them in Spanish). 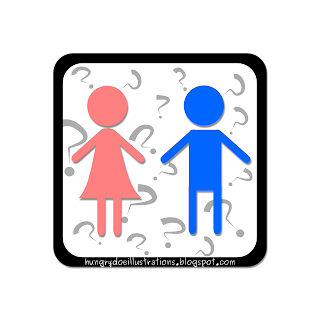 All these thoughts of gender and grammar rolled around in my head and mixed themselves into an interesting question: Is there a connection between gender in a language and that language's cultural view of gender roles? Or, to ask it better, is there a correlation between grammatical gender and gender equality? Google had no answer for me on my first few search terms, so I am doing my own mini-investigation. I, being a native speaker of a language without (or mostly without) grammatical gender, and being from a country that I perceive to be fairly gender equal compared to the rest of the world, predict that countries with languages that have no grammatical gender will be MORE gender equal than those countries with languages that do have grammatical gender. I hypothesize that if gender separation or inequality is not an inherent feature of a language, it may be easier for a cultural people to move towards gender equal practices. The information was gathered from the internet, and then charted in a spreadsheet. For purposes of comparison, I compared the Top 20 most gender equal countries and the Bottom 20 least gender equal countries. Language data was collected from BBC.com's country profiles, which each contain an entry on major languages. In cases where there was more than one major language spoken in a country, the first-listed was assumed to be the most widely spoken and was used in the calculations. Grammatical gender data was taken from this Wikipedia site. In cases where Wikipedia did not provide the necessary information, a Google search with the search terms “grammatical gender in [language]” was performed, and answers came from the first result that provided valuable information. From the data, I generated these charts. 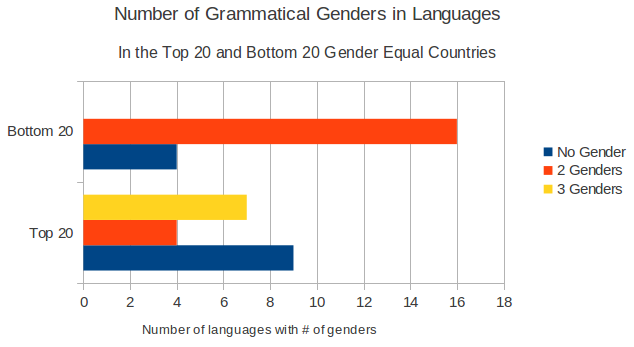 Figure 1 shows a comparison of the frequency of languages with 0, 2, or 3 grammatical genders among the Top 20 and the Bottom 20 countries. You can see the difference between the two is especially strong in languages with 2 grammatical genders. In the languages of the Top 20 gender equal countries, no grammatical gender or grammatical gender with 3 genders are most common, accounting for 16 of the 20 languages. The other 4 are languages with 2 grammatical genders. In the languages of the Bottom 20 gender equal countries, an overwhelming majority (16 of the 20) are 2-gender languages, while 4 are no gender languages, and none have 3 genders. Figure 2 shows a comparison of the number of grammatical genders in a language in order of the countries' gender equality rating (the chart was split in two for space considerations). This graph helps you to see where the grammatical gender categories line up. For example, the in the Top 4 most gender equal countries, 3 of the languages have 3 genders. While there is a higher frequency of languages with no grammatical gender in the Top 20 gender equal countries than in the Bottom 20, the Most-Equal status of many language with 3 genders proves my hypothesis to be incorrect. Although these results don't support my hypothesis, they do seem to suggest that countries with languages that have 2 genders are more likely to have gender equality problems, as there is a high correlation of 2-gender languages and Bottom 20 countries. However, correlation, as we know, is not causation. The majority of countries in the Bottom 20 are either Arabic or French speaking, and both of these languages feature 2 genders. These languages also both have a history of being used in some type of colonial or conquest setting, where they replaced the tribal and native languages. Therefore, rather than the grammatical gender status of the languages, I suggest that it is the lingering effects of the colonialism and post-colonialism, including religion, political unrest, and poverty, that influence the gender (in)equality more than the structure of the major language. Another interesting study would be to investigate the native/tribal languages of these regions and to see whether the number of grammatical genders present showed any sort of pattern. The countries in the Top 20 are mostly modern, European countries with languages based on Germanic or indo-European roots. Their location (and subsequent connection with the rest of Europe), rather than their language, is probably the influencing factor; moreover, the prevalence of 3 and non gendered languages is most likely DUE to their location and the historical progression of European languages. English is the main language of 6 of these Top 20 countries, and even though it at one time was a colonial language, most of the Top 20 countries that speak English have long since moved past their colonial context. I also suspect that holding the status of "Language of International Communication" has given these English speaking countries a higher likelihood of positive economic activity, leading to their stability. It seems pretty clear that an increased number of grammatical genders is not related to an increase in gender inequality. 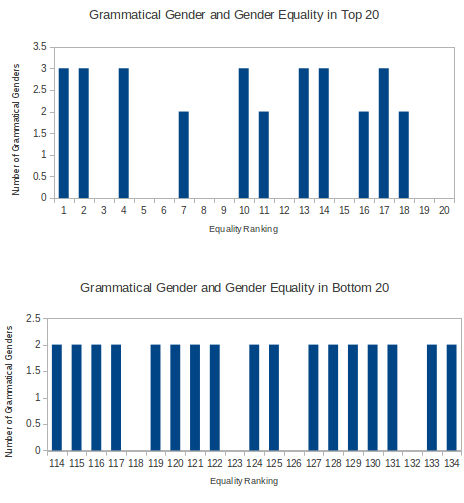 The correlation between 2-gendered languages and countries with low gender equality rankings is interesting; however, the correlation is likely coincidental or based on factors outside the language itself. Further studies could investigate a greater number of factors connected with both the language (like word-order vs. case status, article vs. no article, etc.) and the countries (GDP, government type, stability, other languages, colonial history, etc.). Moreover, it would be interesting to investigate people's perceptions of gender (in)equality in language based on the gender equal status of the country in which they reside.